When Paul Cunningham, Michael Van Horenbeeck, and I set out to write the best possible book covering all aspects of Exchange Online and the other parts of Office 365 that administrators should understand, we knew that the old publishing model of write-edit-print could never keep pace with the development cadence used by cloud services. We therefore resolved that we would update the content frequently and issue new versions to make that content available to readers. Our first version was released at the Microsoft Ignite conference in May and spanned some 630 pages. We learned a lot about the process required to take raw text and bring it together to make an eBook. We learned even more about formatting and layout to support the EPUB and Kindle formats. And then we found out that we had a lot of work to do to understand, assess, and write about all the new information released by Microsoft at Ignite. Now we’re done and the second version is almost ready. We plan make the eBook generally available at a reception sponsored by Binary Tree at the IT/DEV Connections conference in Las Vegas at 5:30PM on September 16. Naturally, if you are at Connections, we would love for you to come along and join the party. Please RSVP mailto:susan.padien@binarytree.com?subject=Book-Signing if you’d like to be at the event. The second edition contains 150 pages of new content together with a heap of changes, updates, refinements, and responses to questions asked by readers. We have extensive coverage of Office 365 Groups, Delve, the Compliance Center, and the Import Service and consider the eBook to be up to date with the current state of Office 365 – or as close as we can make it. But given the nature of Office 365, we know that we have even more work to do to keep pace as Microsoft releases more updates over the next few months. That work will be seen in the third edition, due in April 2016. The full price for the second edition is $44.95. However, if you bought the first edition from the ExchangeServerPro.com site and took out membership of the site, you’ll be able to update to the second edition (PDF or EPUB formats) for $10. The upgrade offer will be available from September 16 to September 23 and after that date site members will have to pay the usual price. We will not be able to extend the update offer to you if you didn’t buy a PDF or EPUB version from ExchangeServerPro.com. However, to launch the second edition, we will make the book available to everyone for $38.20 (a discount of 15%) until September 30. If you bought the book from ExchangeServerPro.com, please wait until we send email to you with the discount code to obtain your copy of the second edition for $10. Otherwise, if you’d like to buy at the reduced rate of $38.20, you can place your order now. Unfortunately, we are unable to create the same type of upgrade offer for Kindle purchasers. There are multiple reasons for this, including the fundamental points that Amazon doesn’t support the kind of model that we would need to be able to provide a discount to previous purchasers plus the large percentage of income taken by Amazon for their royalty. 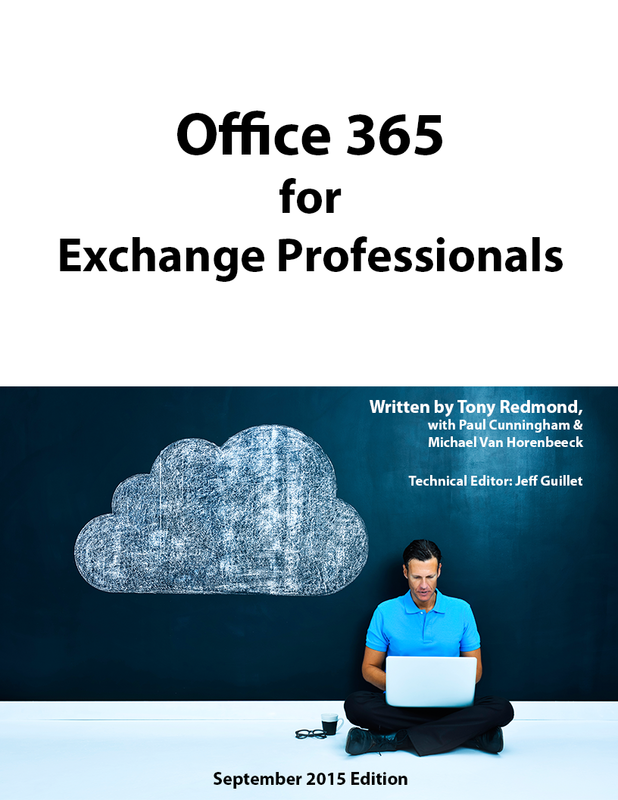 In fact, the Kindle version of the second edition of Office 365 for Exchange Professionals will be treated by Amazon as a completely new title that has no relationship to the first edition. We could release the second edition as an update to the first, but that doesn’t make commercial sense as we would then be giving away the new edition for free to all who bought the first edition. Believe me, no one does books like this to make their fortune. Technical books do not sell in the same quantity as bestselling novels! We have some work to do to prepare the Kindle version so the second edition will not be available on Amazon until September 23. Creating this eBook has been both terrific fun and a real challenge. It’s fun learning, but it’s a challenge to keep tabs on what’s happening inside Office 365. At times, we almost think that the engineers are playing with us when a new and unexpected feature turns up to throw our carefully managed schedule into disarray. But that’s the world of the cloud and it’s the reason why we are publishing in the manner we are. Stay tuned for more news about Office 365 for Exchange Professionals. We hope that you enjoy the second edition and that it justifies the same kind of reviews we received for the first edition. And thanks again for all the support received from friends, fellow MVPs, and readers. I’ve been working with Exchange for as long as I can remember and I’ve read many-of-book on the subject from the authors of this particular book. I’ve always found books written by them very, very useful on all areas of the chosen subject. This book adds to that great collection – if you’re looking for something that really explains the ‘What’s, If’s and How’s of Office 365 – get this book! Even if you think you know the subject inside out I bet there’s something written in here that will even surprise YOU! As always, great material from the author! I carry this book with me on my phone as a quick reference. Great tool! This entry was posted in Email, Exchange, Office 365 and tagged Delve, Exchange Online, IT/DEV Connections, Jeff Guillet, Michael Van Horenbeeck, Office 365, Office 365 book, Office 365 for Exchange Professionals, Paul Cunningham, SharePoint Online, Skype for Business, Tony Redmond. Bookmark the permalink.